Welcome to Best Backup Tutorial. 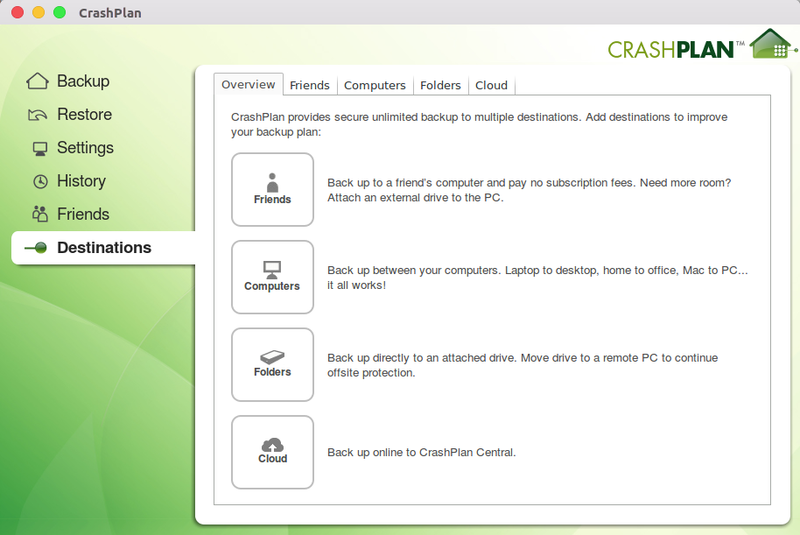 CrashPlan is a well known online backup solution that supports Windows, Mac and also Linux. This tutorial is going to show you how to install CrashPlan for Small Business. Previously this product was known as Crashplan PRO. This backup client software comes with a simple and nice user interface. It requires Java JRE to run but it will be downloaded automatically if you don’t have it yet. Today, we are going to assist you how to install Crashplan for Linux. The CrashPlan for Home is not available for new user since August this year. The only option for us now is to choose the business plan. We have to pay about $10 per month per device to use the Business Plan. Well, that is that, lets get back into the topic. Crashplan for Linux is a GUI software that helps us to protect our Linux data. If you are running Linux for your daily activities, we highly recommend this backup software for your Linux system. Backup is an integral part of computing. With today’s massive ransomware attack, data protection is a must. Even for Linux, you still need to have a good cloud backup to prevent data loss because of ransomware, and any other circumstances. I am pretty excited with Crashplan for Linux. There are few popular software developers who ports their software for Linux environment. Crashplan is one of them. It’s a native application for Linux so it works pretty well on most Linux distribution such as Ubuntu. First, download Crashplan for Linux installation file using the link below. Now follow on screen installation wizard. Simply answer few question on your screen. Wait until the installation complete. Once completed, you can run Crashplan application on your Linux desktop. We test this software on Ubuntu 16.04 Xenial Xerus and it works pretty well. Please make sure you can connect to the internet during installation. It will download some files from the internet. Open Crashplan from your application menu and on the first page, you will need to login or create new Crashplan account. Simply enter the required fields and click Create Account. After you login, Crashplan software will start it’s job. It will scan for your files. In Linux, it will automatically detect files and folder inside your home directory. You can change it from the main window. Crashplan for Business comes with unlimited Crashplan Central cloud storage. With only $10 per device per month, you can backup as many devices as you like to your Crashplan account. No need to worry about cloud disk space anymore. From the main window, click the Backup tab on the left side. You will see several sections on the right panel such as Destinations, Files (Source) and Inbound. Crashplan allows us to backup to our friends computer at no cost. With this feature, you can backup your data to your friend’s computers for free. It’s a great option if you don’t want to backup your data to the cloud. But we always recommend to put your backup in the cloud for better security. With this feature, we can store our backup from one computer to another computer. Simply install Crashplan on other computer and login with our current account. This feature allows us to store our backup in a folder, for example on an external drive. Select cloud to enable cloud backup. Your data will be sent to the Crashplan Central cloud storage over the internet. 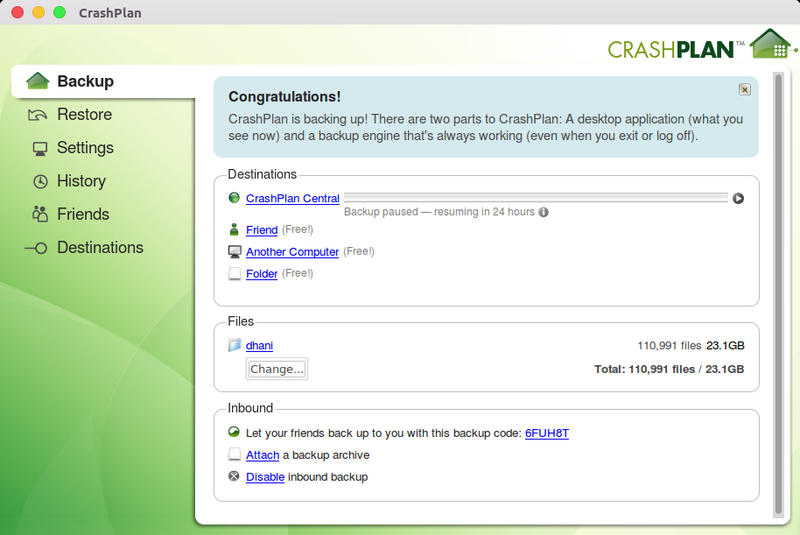 Crashplan for Linux is a great backup solution for Linux users. We can easily backup our data to various backup destinations. 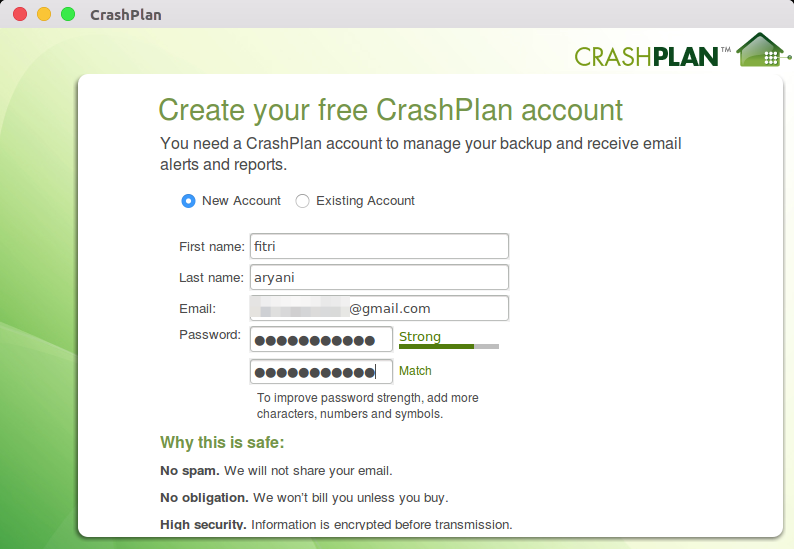 Crashplan offers a great plan, unlimited data storage for their backup plan. We test this Crashplan for Linux on our test bed. We use Ubuntu 16.04 Xenial Xerus to perform the test. It’s not a paid review or tutorial. We just want to share with others how this Crashplan works for us.